"We still have lots more ideas to explore"
Yoshi's Woolly World is out now in Europe - it heads to North America on 16th October - and is the latest major retail arrival on the Wii U. 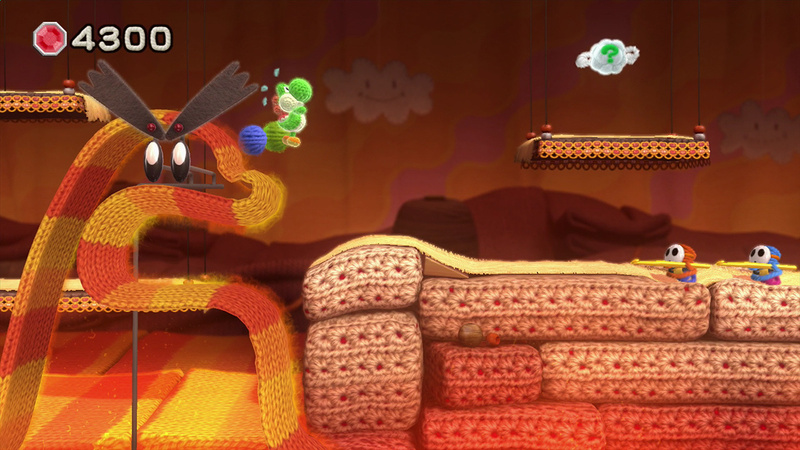 First teased back in 2013, its visual style and design brings a natural evolution to the yarn aesthetic seen in the excellent Kirby's Epic Yarn on Wii. Utilising the Wii U for a new HD engine, amiibo support and more, this latest title from Good-Feel does - in our view - secure its place among the elite releases on the system; we gave it a glowing recommendation in our review. With its arrival in all good European game stores coming today we had the opportunity to pose some questions to Nintendo producer Takashi Tezuka, and Good-Feel executive producer Etsunobu Ebisu. We asked about some of the design choices and decisions, the use of amiibo and the balance between accessibility and challenge. Considering the visual styles, do you consider Kirby's Epic Yarn to be a true spiritual predecessor to this game, and can you tell us about when the idea for Yoshi's Woolly World was conceived? 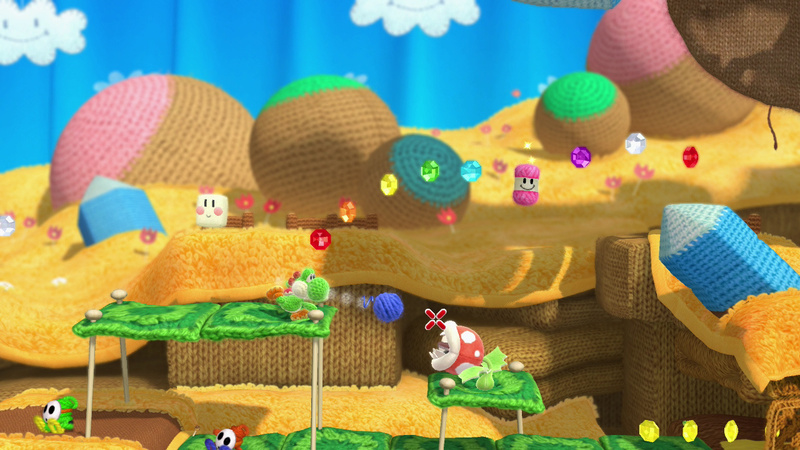 Takashi Tezuka: Yoshi's Woolly World isn't a sequel to Kirby's Epic Yarn. It started simply with our desire to make a new Yoshi game that used woollen yarn in all kinds of creative ways. 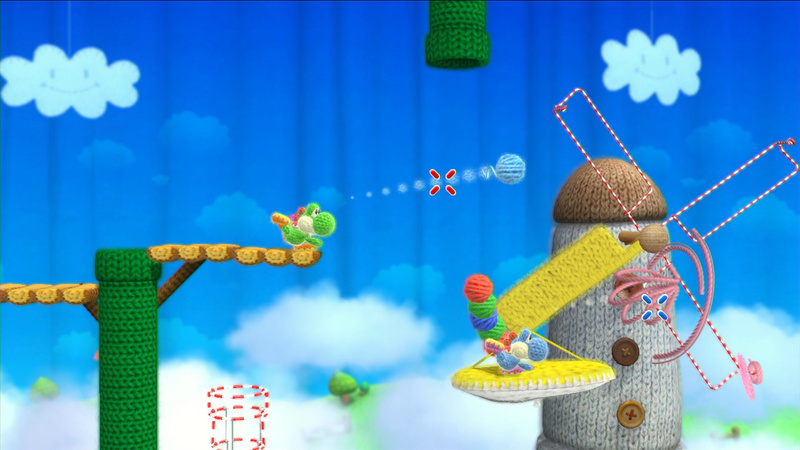 Beyond the visual detail of yarn it's noticeable that the environments are made to move and soften under Yoshi's weight, for example. How difficult was it to create this effect? Etsunobu Ebisu: We actually put a lot of effort into getting the look of the yarn just right, and capture the subtle details of the threads. On top of this, we made it react just like you would expect if you could touch them, as you can see with the environments gently bending under Yoshi's weight. We wanted players to really feel like Yoshi was in contact with yarn, so some objects needed to react differently from others. This involved a lot of computation, so we needed to find ways to optimise that too. How has the woollen premise promoted fresh ideas in stage and puzzle design, and can you explain how some particular ideas were conceived to utilise the concept? Etsunobu Ebisu: Since everything is made of wool, we started by thinking about what this might mean for all the different objects in this world. We thought that it should be possible both to make objects out of wool and to unravel them too, which led us to the idea of Yoshi being able to unravel walls or knit together helpful objects. How did the use of Yoshi - as a character - and his specific capabilities inspire ideas for Yoshi's Woolly World? Takashi Tezuka: We came up with a multitude of ideas by imagining what might happen if Yoshi lived in a world made of wool. Having this clear artistic vision of a world made of wool (with everything being soft, and made from knitted yarn) kept everyone on the development team on the same page, making it easier to come up with ideas that worked. Two player local multiplayer is included once again - in what unique ways can co-operative play be enjoyed in Yoshi's Woolly World? Takashi Tezuka: The key point about the multiplayer is that it isn't just co-operative, you can also compete against each other sometimes. There are ways to help each other, for example you can swallow the other player and turn them into a ball of yarn so you can throw them somewhere they could never get to by themselves. However, you can also use this system of turning the other player into a ball of yarn to mess with them and have a bit of fun at their expense. Yoshi's Woolly World retains the Yoshi series tradition of collectibles and the challenge to '100%' levels - how important is this as a method to increase the difficulty of this game for experienced players, and is it fair to say that this game is particularly helpful to young or less skilled players? Takashi Tezuka: Fans of the Yoshi series likely remember very well just how much is still left to do in those games even after your first playthrough. 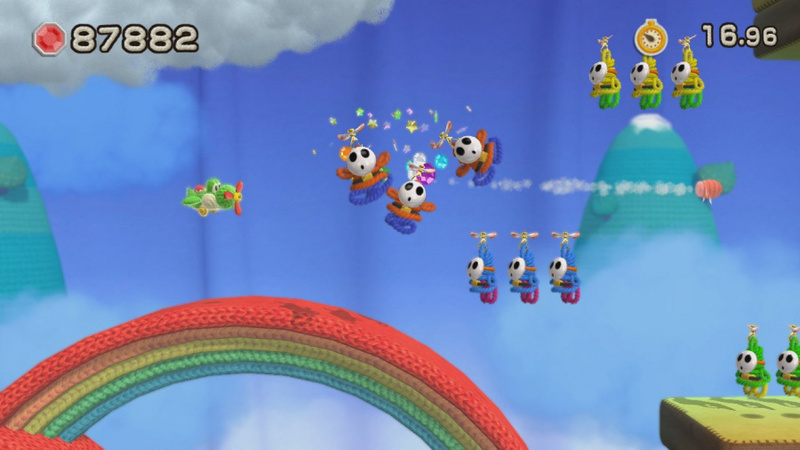 The graphical style for Yoshi's Woolly World is soft and cute, so it may look like we are targeting a younger demographic, but we also wanted fans of the Yoshi series to enjoy it too. We put a lot of thought into what we can offer them. For players who aren't so experienced with platform games, we've included Mellow Mode, which has lots of items to help the player. It's also much easier to control Yoshi in the middle of a jump. On the other hand, Classic Mode has more of a challenge and lots of collectables to find on each level, so there are plenty of reasons to keep coming back. Can you tell us a little about Yoshi's transformations, and how some of the ideas and concepts for these quickfire challenge areas came together? Takashi Tezuka: With platform games, it is difficult to maintain a high level of tension for a long time. Including a time limit in these transformation areas gives us a chance to change up the pace of the game. Having something different like this gives players a break from the normal gameplay, and they can start the next level feeling refreshed. There's been a hugely positive reaction to the yarn amiibo toys over their appearance; what was your reaction to the final design, made with wool rather than being a plastic toy similar to the Super Smash Bros. range Yoshi? Takashi Tezuka: We didn't have any experience in making woollen toys, and a very large number of them needed to be made, so the woollen Yoshi amiibo project was filled with lots of new experiences for us. We put in a lot of hard work, so I was really moved when I got to see a sample for the first time. Users all have different tastes, so we created three different colour variations. We wanted to create something that might even interest people who prefer the figurines. This way they can choose the colour they like best. Can you explain how the development team came up with the amiibo functionality - namely the concept of adding a second assist character on screen and the ability to assign Yoshis of various designs? 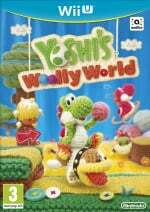 Etsunobu Ebisu: In Yoshi's Woolly World, Yoshi is made from wool, so right from the beginning we imagined having lots of different Yoshis made using different coloured wools. It was a natural step to have amiibo add Yoshis with different colour patterns into the game. As for the Yoshi amiibo themselves, since this is a Yoshi game we wanted to do something nice, and give users a fun surprise, so we decided to make the Yoshi amiibo actually appear in the game. Good-Feel has now produced two games with 'yarn' styles, so can you share what it is about the concept that keeps bringing you back? Etsunobu Ebisu: Yarn can be used to make all kinds of different things, and the items themselves seem to take on a warmer and more adorable feel. This even extends to the gameplay too, and allows us to introduce fun new mechanics. This is what makes using yarn so much fun. The first game we made using yarn was in 2D, while for Yoshi's Woolly World we have migrated to 3D models. Saying that though, we still have lots more ideas to explore. We'd like to thank Tezuka-san and Ebisu-san for their time. It is such an awesome and incredibly cute game. I really love playing it. If anybody tests out silver Mario in game and it turns Yoshida silver please let me know. I haven't taken mine out of the box yet b/c I can't find a reason too. I got the game today and the first thing I did was scan all the Amiibo in, the entire Smash roster works except the Pokemon. Other than that, I've only been playing for an hour or so, but I think this is my game of the year so far. The cuteness is unbearable. I'd put it down as graphically the most impressive game this year. Other games might look more technically capable, but none are designed as beautifully and well as this. I'm already enjoying this more than I enjoyed Arkham Knight this week. question: does the blue woolly amiibo yoshi appear blue in-game? I have all 3 but not sure can bring myself to open them. Love the blue one though! Incredible game, I've had a blast playing it today (I'm spreading myself too thin though, playing both this and Arkham Knight simultaneously). To all the people in NA, if you're still on the fence for this game, it's fantastic. Visually, it's one of the most beautifully designed and visually appealing games of the year. Gameplay-wise, it's so fun, and with the plethora of collectibles, you'll be sinking a lot of tim in the game. Better than Kirby's Epic Yarn (because as you progress, there can also be a challenge, plus the collectibles). Wow, what a very clever and beautiful game. It's not fine art but it is extremely well crafted. I am not looking forward to the amiibo hunt tomorrow but whilst on the subject of amiibos I would love a yarn poochy amiibo. @rjejr you just gave yourself a reason to. Set the Amiibo free or you're not living life to the fullest. Great interview, still more ideas to come? That's incredible considering the amount of surprises in Woolly World. It feels like they threw everything at this game. The level design is absolutely top class, it's already surpassed Yoshi's Island for me and I'm only in World 4. I can't wait for this to arrive here in NA, day one for me! Its so cute! Is it just me or in some questions they just completely ignore it and give generic PR speech or something. Put a few hours into this now and love it, great feel to the whole thing! I love the art style of this game, and I am a long time yoshi fan so it makes it ten times better!!! NA release can't come soon enough! And Europeans also get a free download code for Yoshi Touch & Go if they download Yoshi's Woolly World. I would get this today but I'm still addicted to Splatoon!! Its a great game! A lot better then I expected. @Tsurii - Thanks. Got silver Mario for my birthday last month and it's still in the box. My wife got Peach from our son for Mother's Day and that's still in the box as well, thy're a happy couple in suspended animation for all time. Though I'm sure I'll open them someday. Well maybe.